Great Post Mike, I was actually going to post the same thing myself tonight. My monthly averages are all the same as yours except I came up with 27.9" for the seasonal average if as you say God forbid it doesn't snow for the next three years, I'm sure it's a rounding thing. Hoping the 1991-2020 average doesn't end up being 29.9 that will frustrate me to no end. I think the 27.9" may be more accurate. I just summed up what the rounded numbers would be. This morning, the temperature fell to 8° in Central Park. That is the 4th day this winter that the thermometer has fallen below 10°. The last winter with at least as many such days was winter 2014-15 when there were 9. This was also the 11th consecutive day on which the temperature fell below 20°, the most since there were 11 consecutive days from December 17-27, 1989. CP, how many days has the temperature not gone above freezing so far at Central park? I think the run in 1961 was 16 days. The same Donald Sutherland from “Ordinary People” and “The Hunger Games”? I cannot categorically deny it isn't, so maybe. Streak forecast to end at 13 days..but its will be close, seems to have trended slightly cooler. Short of the record of 16 days but that'd be good enough to tie 3rd place in the Park. 2nd at JFK, 3rd at LGA. 1961 will still be the king! That stretch is still the best one as it was accompanied by two major snowstorms, the JFK Inauguration Snowstorm of 15 inches and the transitional Feb 3 and 4 of 20 inches.There were a few 3 to 4 inch snowfalls in between as well.This recent cold stretch has been meager for snowfall in comparison. Yesterday was the 13th consecutive day on which the temperature remained below freezing in New York City and this morning marked the 13th consecutive day on which the temperature fell below 20°. Both are the longest such periods since the 16-day period from January 19 through February 3, 1961. Never question Docs memory, when it comes to weather at least. OK, into the dusty annals of weather long past I have found information on that 16 day stretch in 1961. I KNEW it was not Feb 2 when the streak ended!!! It looks like the below freezing streak will end today in New York City at 14 consecutive days. A couple of days short of the record but still a nice streak. No record low temperatures were set in Central Park during the 14 days but there were a few in some of the surrounding stations. To clear up any confusion from yesterday the streak began on December 26, on Christmas day the temperature did get above freezing in New York City. It will run through January 8 as today in all likelihood it will go above freezing in Central Park with the temperature sitting at 31° there right now. Yes, it was a nice streak in comparison to the mild periods we have had the last few years.In addition, it gave us here in the HV a White Christmas.1961 still king, though, longer subfreezing period and a lot more snow during that stretch. docstox12 wrote: Yes, it was a nice streak in comparison to the mild periods we have had the last few years.In addition, it gave us here in the HV a White Christmas.1961 still king, though, longer subfreezing period and a lot more snow during that stretch. For sure Doc, 1961 blows this one away. Also January 1994 saw a much longer period of sustained cold even though it popped above freezing a few of those days. Yes, CP, that amazing year of '93-'94 with sustained cold and that incredible ice storm where it was pouring rain T Storm style at 21 degrees.There was over 1/2 to 3/4 inch of ice on the ground and the temperatures plunged staying below 15 degrees for a week.Towns ran out of road salt and schools close nearly a week.I was using a pick axe to break up the ice on the walk and driveway,LOL.Had to get to work, when you are self employed, if you don't work you don't eat,LOL, no sick days or snow days allowed!!!! ends 347 consecutive hours at or below freezing. Below is a chart of snowfalls 8 inches or greater in NYC since 1870 by 7 day period. As you can see the coastal areas like NYC are in their prime period for the next month. The 14 day period of February 2nd through the 15th is the prime time frame historically, with 28 storms in that 14 day period. I specifically chose 8 inch storms in NYC because many times, if not the majority of times, our geographic area exceeds a foot of snow when central park is recording 8 inches or more. Of course the time periods here extend out later in the season for big storms the further north and west you are from NYC. Great chart CP.There is that "dead of winter" I always mention, Jan 21 to Feb 21 highlighted in red.February is our snowiest month . With the 1" of snow CPK received from this latest system (0.1" for the 29th and 0.9" for the 30th), the seasonal snow total is now at 18.9", which is higher than 43 of the 148 snow seasons, or the 29th percentile. Math23x7 wrote: With the 1" of snow CPK received from this latest system (0.1" for the 29th and 0.9" for the 30th), the seasonal snow total is now at 18.9", which is higher than 43 of the 148 snow seasons, or the 29th percentile. Including this season and using 1869/70 as the first full season of record keeping this season marks the 149th season. I was comparing 2017-18 to the 148 snow seasons from 1869-70 to 2016-17. Of those 148, 43 had less than 2017-18. 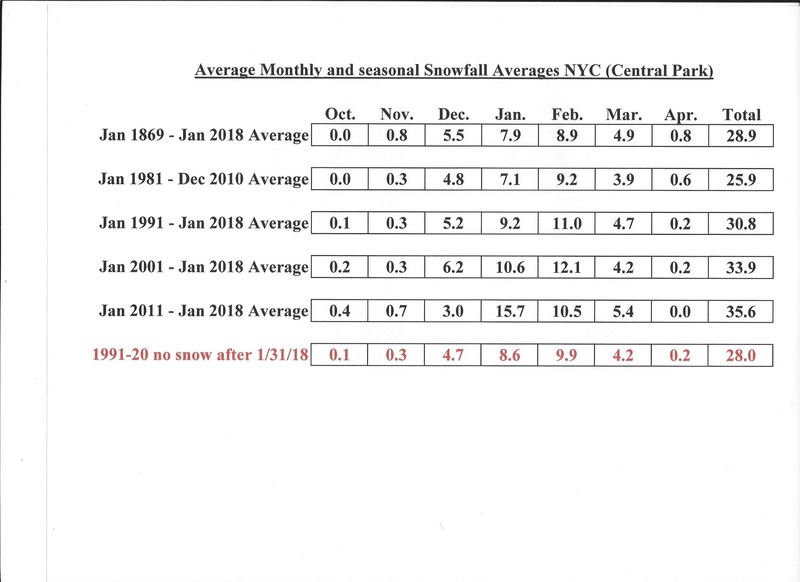 The chart above summarizes the monthly and seasonal snowfall averages in New York City over different periods of time. The first line reflects the historical averages from January 1869 through January 2018. Through the almost 150 years records have been kept the seasonal snowfall averages 28.9 inches per season. The second line reflects the number most people would see now on websites or on the weather Channel which is the 30 year average. For those that don't know how these are calculated, NOAA updates these averages every 10 years. The next update will be in January 2021. If you look on any websites the average will show 25.8 inches. The reason for the discrepancy is NOAA has a 7.0 figure for January when the actual calculated average is 7.1. 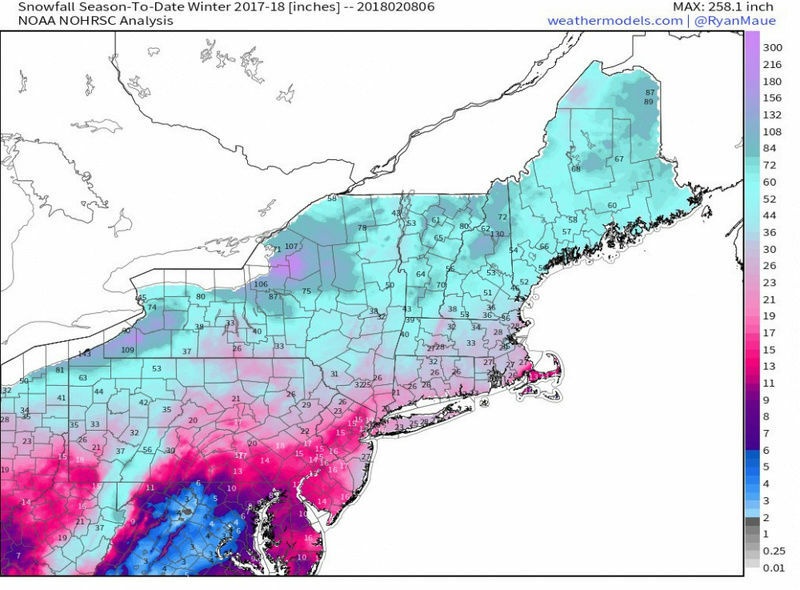 They originally calculated 25.1 inches for the season, but in March 2014 they finally relented and admitted their mistake and updated the totals accordingly. I've told that story several times I won't bore anyone with the details again. The third line which I find the most interesting is the average right now from January 1991 through this past January. This will be the time period NOAA uses for the new 30 year averages when they are calculated in three years. As you can see the seasonal average stands to jump almost 5 inches per year to 30.8 inches which is what New York City has averaged the last 27 years and one month. The next two lines are the averages from January 2001 to the present which is a robust 33.9 inches, and January 2011 to the present which is 35.6 inches. The last line shows what the new 30 year average would be for 1991-2020, should God forbid no snow fall for the next two years and 11 months, which is 28.0 inches. There are several things of note here but the most pronounced is the increased amounts of the averages in the months of January and February. Even as compared to their 150 year averages January and February are seeing a nice spike in the last 30 years most notably in the last 20. CP, EXCELLENT work and very enjoyable to read.Just goes to show changes have happened as that snow total for each period gets larger.Stats don't lie, it's there in all it's details, we have surely been getting more snow since 1991. Including todays 0.5 inches of snow reported at Central Park, the total since January 1, 1991, which will be the begin date when they calculate the new 30 year seasonal snowfall averages for 1991 through 2020, the Park has received 840.3 inches of snow. If Central Park receives 59.7 inches of snow between now and December 31,2020 NYC will have a 30 inch seasonal snowfall average, which has not happened since the 1930's. They are already assured a 28 inch plus average which has not happened since the 1941-1970 average. Let's hope the next 2 1/2 years are not like the late 90's. I realize with a little less they could still reach it with rounding, but I'm trying to play it safe here. 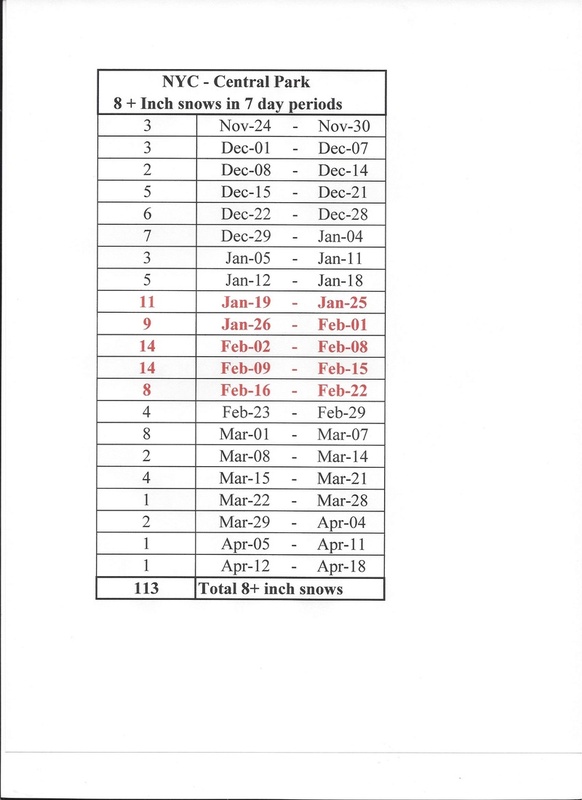 CPcantmeasuresnow wrote: Below is a chart of snowfalls 8 inches or greater in NYC since 1870 by 7 day period. As you can see the coastal areas like NYC are in their prime period for the next month. The 14 day period of February 2nd through the 15th is the prime time frame historically, with 28 storms in that 14 day period. The so called prime period for 8 inch plus snows in NYC, Feb2 through Feb 15th, will be a big bust this year. Throw in the Apocalyptic end of Winter forecast by Orange Countys deceased groundhog Othelia and this is a major letdown. There's still time, but with onyl 4-5 more weeks of prime winter season left, time for many in our area is running out. This is the snowfall map so far this season in the northeast. NENJ apparently is the snowhole this year in our area as some have been complaining. The clear winner here as always the Tug Hill plateau in NY. Over 250 inches there already this season. That map is garbage. There is no way, and I mean NO way, that I've seen anywhere close to 26 inches of snow this winter. A 5 inch, a 6 inch and what? 15 dustings that are counted as an inch each? TheAresian wrote: That map is garbage. There is no way, and I mean NO way, that I've seen anywhere close to 26 inches of snow this winter. A 5 inch, a 6 inch and what? 15 dustings that are counted as an inch each? Over most of our area I found it to be pretty accurate. As we all know you are in the snow hole like no other. With 100 inches to the north and west and then the snow lovers hell that is Painted Post. I imagine there are no official reporting stations near you. I guess the closest one is Elmira and that's probably where the 26 is.